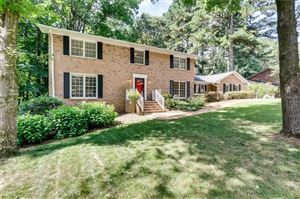 3677 Doroco Drive Atlanta, GA 30340 listed by Sally English, Associate Broker at Realty Associates of Atlanta LLC. Call or text Sally English direct at 404-229-2995 for more information about this home. Easy walk to Evansdale Elem from this updated soft contemporary with Mid-Century Modern tones.Open interior, volume ceiling and lots of floor to ceiling windows create a light and stimulating interior. Renovated kitchen and baths put it in the move-in ready category.Stain resistant Valore flooring throughout living area. In-law suite on lower level. Fenced back yard.Immaculate landscaping. STEM empowered Evansdale Elementary School and Trendy Tucker afford this home extra amenities beyond the norm. Convenient to Emory, CDC, CHOA. 2745 Sq ft per DeKalb Tax records. Mid Century Modern tones in this 70’s Multi-level floor plan. Stone and frame exterior. Open interior with volume ceilings, lots of light, and windows. Shaw “Easy Clean” Valore Vinyl Plank throughout main living area makes it easy to clean up after pets and play. New insulated windows, new exterior doors including glass doors to patio and deck. Replaced roof (2012), HVAC (2011), Driveway (2009). Kitchen renovation and bath updating 2012. Lights, electric receptacles replaced at same time. Easy Interstate Hwy access at I-85 and Chamblee Tucker Rd. Hop on and off inside the perimeter. Check out the cool shops and restaurants on Tucker’s vibrant Main Street. Publix, and Kroger nearby in Tucker. Sprouts and more shops at Northlake. Entry foyer is reached by sidewalk from driveway. Wrought iron handrail and ceramic tile stop to stain finish front door with architectural window inset. Foyer has steps up to bedroom level and cased opening to living room. Living Room could be used as your media room or casual sitting area. Valore plank floor. Floor to ceiling triple window. Ceiling fan and light. Cased opening to dining room. Dining room also has the Valore flooring. 2 glass doors to deck. French door to kitchen. Doggie door. chandelier. Kitchen renovation in 2012. Stain finish cabinets with granite countertops and tumbled marble tile backsplash. Under-counter double bowl sink with gooseneck faucet. Built-in desk. Open to breakfast room. Breakfast room adjacent to kitchen has two glass doors open to deck. Railing overlooks family room below. Steps down to family room. Two story family room is overlooked by breakfast room and bedroom level hall. Stone fireplace with raised hearth, gas piping, Stairs up to main level. Wall of glass overlooks patio – includes two glass doors. Mudroom has doors to laundry room, garage and in-law suite. In-law suite bedroom has carpet flooring, wall of closets, double window. In-law suite bathroom has a stain vanity cabinet with granite countertop, Tub-shower combination with glass doors, ceramic tile floor, window. UPPER LEVEL has 3 bedrooms and two full baths. Master bedroom features carpet, new windows, ceiling fan and light, architectural accent wall behind bed, double window. Bedrooms #3 and 4 are nearly identical and feature carpet, exterior French doors that open to a small balcony with wrought iron type railing. Ceiling fans and lights, double folding door closets. Back yard has multiple personalities. Nice land scaped area with interesting patio with a stone and stucco (concrete) finished wall and wrought iron fence. Separate fenced area (chain link) divided into a play area and a dog run. Deck in this area has lots of possibilities for sitting and dining groups. Immaculately landscaped lawn and gardens. Irrigation system. Newer concrete drive and walks. Students at 3677 Doroco Drive Atlanta, GA 30340 attend STEM certified Evansdale Elementary, Henderson Middle School and high performing Lakeside High School. r workstations for students are a part of each classroom. All students and teachers have access to a computer lab. Art, music, and physical education teachers provide instruction to all students. The Leon Sims Nature Center is a part of the school campus and provides opportunities for outdoor educational programs. After-school activities for students include a drama club, chess club, and student council. I-85 North to Chamblee-Tucker Rd. Right on Chamblee-Tucker Rd to right on Mercer Drive. Right on Henderson Mill Rd. Left on Evans Road. Left on Doroco Drive.